Fruit Kitchen Wallpaper Border. Dark colors--Purple, Green on Off-White. Fruit kitchen wallpaper border in dark colors. Rich Purple and Dark Green predominate with touches of lavendar. On Off-White. Top edge has a rope design and the bottom edge repeats the rope design with a more elaborate pattern. Grapes, pears, plums, blackberries, apples are on a vine with lots of green leaves. A dramatic addition to a Kitchen or Breakfast Room. 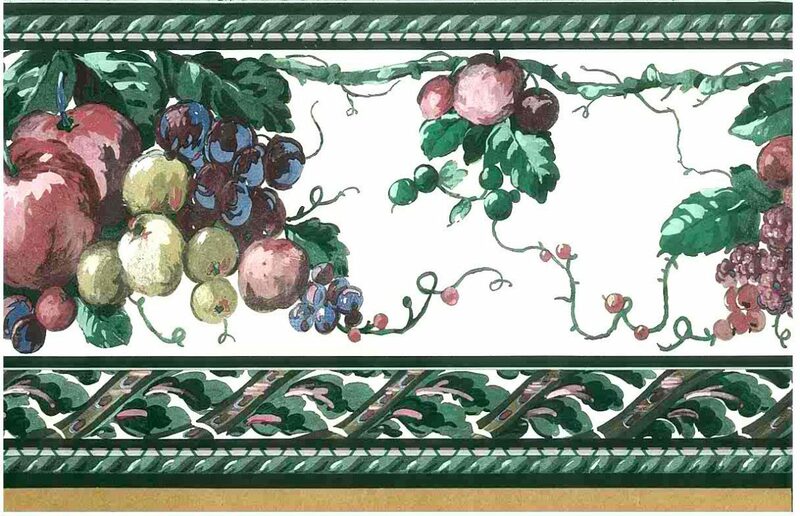 This fruit kitchen wallpaper border is a stunning pattern in a rich cottage style.